Metro transit would like to thank our MetroLink, MetroBus, and Metro Call-A-Ride customers for their patience during delays caused by last week’s major snow storm that brought sub-zero temperatures and a foot of snow to the St. Louis area. “The safety of our passengers and our operators is always our top priority. We safely transported our customers where they needed to go despite the extreme weather and road conditions,” said Ray Friem, Metro Chief Operating Officer Transit Services. Metro employees worked long shifts and many went above and beyond the call of duty to keep transit running as the snow piled up and the wind chills dropped at one point to 30 degrees below zero. Crews worked hard to try and keep MetroLink platforms, stairs and Park-Ride lots cleared. We kept our customers updated about service delays and the status of transit operations around the clock via our Facebook account at St. Louis Metro Transit and our Twitter account @STL Metro, and through the news media. The latest Rider Alerts were posted on our website. Here are a few of the kind words you shared with us during and after the winter storm. A tip o’ my sherpa hat to St. Louis Metro Transit buses. Yesterday, a foot of snow coming down throughout the day: All my buses running within 3 minutes of scheduled time. This morning’s commute: 8 degrees below zero (before factoring in wind chill) and #30 bus within 90 seconds of scheduled time to pick me up. I like my buses. So cars out here struggling and swerving off the road but @STLMetro is running great! This is why I take public transportation!! Thank you @STLMetro for braving the cold, so we can all still function! On behalf of the patients and staff at the Barnes-Jewish Dialysis Center, we would like to thank your agency for the service provided this week. Our Call-A-Ride patients made it to treatment and the drivers who brought them were professional and demonstrated a good attitude. Please pass on our gratitude to your drivers. Appreciate the updates. Also appreciate all the drivers and support people getting us where we need to go. Of course I appreciate the day in day out service. Just really grateful that you all work together in extreme circumstances like we have experienced the last couple of days. Thanks. And be careful out there. 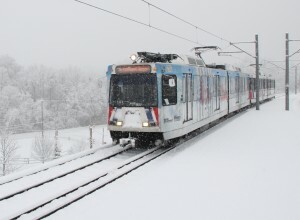 We encourage you to follow us on Twitter and to like us on Facebook so you too can get the latest Metro weather-related service updates and information about delays any time of the year. We will always do our very best to get you safely where you need to go. Thanks again for your patience and for choosing public transit.